Steelhead are the anadromous (ocean-going) form of o. mykiss. Like salmon, steelhead return to their native streams to reproduce, nourishing surrounding ecosystems in the process. Unlike salmon, steelhead can complete this cycle multiple times, living up to 11 years. California's wild steelhead have declined 80-90% and have been protected by the Endangered Species Act since 1997. Read more at the National Marine Fisheries Service website. The San Francisquito Creek is one of the last free-flowing creeks in the Bay Area. This creek provides critical habitat for native steelhead, but was recently listed as the 5th Most Endangered River nationwide due to Stanford University's Searsville Dam and water diversions for campus irrigation. Image from EPA.com: read more about a recent restoration project on the creek. The 125-year old Searsville Dam blocks fish passage and degrades watershed health. Searsville does not provide hydropower or flood control; the primary purpose of the reservoir has always been to provide irrigation water to Stanford. Today, the reservoir is more than 90% full of sediment and debris. The majority of Stanford's irrigation water is stored elsewhere, primarily in Felt Lake. Image by OCE Foundation, with aerial support from Light Hawk, June 2015. 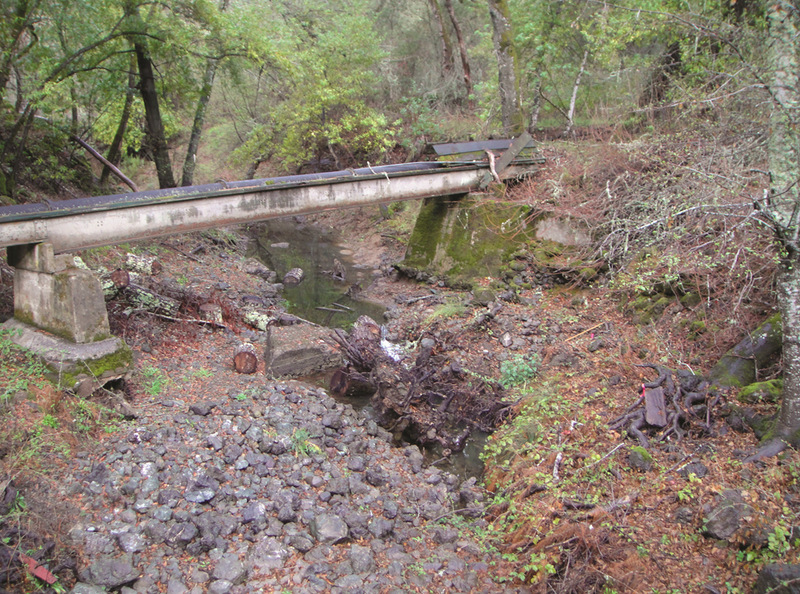 Stanford's extensive water diversions cause abrupt changes in downstream flow. Dead steelhead have regularly been found in dried up sections of the San Francisquito Creek downstream of campus. This photo was taken during a court-ordered inspection in February 2014, which followed a rain storm. Despite robust flow upstream of the dam, the area below Searsville was practically bone dry. Read more about the lawsuit and see more images at Our Children's Earth Foundation. Early in 2013, steelhead were observed spawning in the San Francisquito Creek downstream of Stanford's water diversions. By May, portions of the creek had dried out completely, stranding and killing the remaining adult steelhead. Image by Menlo Park resident Mike Lanza, author of Playborhood. Read the full story here. Searsville Reservoir provides a decreasing amount of water storage each year, but Stanford operates two other large, off-stream storage areas for irrigation water. Stanford's main irrigation reservoir is Felt Reservoir, which was constructed in the 1920s in conjunction with Stanford's golf course. 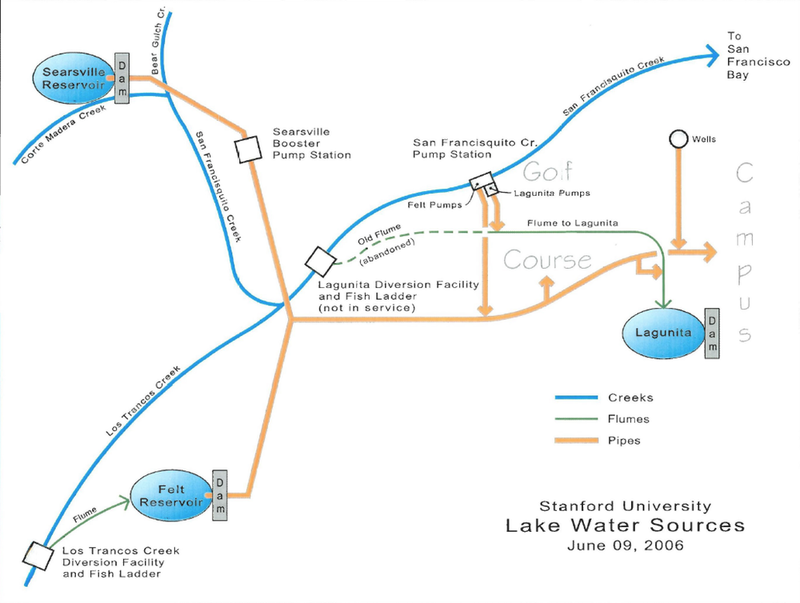 This diagram of Stanford University's "Lake Water Sources" has been used in multiple presentations by staff from Stanford's Water Services and Civil Infrastructure department. The San Francisquito watershed spans from the Santa Cruz mountains to the San Francisco Bay. Accessible streams in this watershed are designated as critical habitat for steelhead, and the watershed as a whole is an anchor watershed for steelhead recovery. Searsville Dam is located at the confluence of several streams in the western part of Stanford's 8,000 acre campus, just upstream of the San Francisquito Creek. Since the 1920s, this creek actually runs through Stanford's golf course. "Sooner or later Searsville Dam must come down, and the whole San Francisquito Creek watershed can be treated as the ecological treasure that it is." The first three projects to receive grant funding are the Matilija Dam in Ventura, California; a series of dams and obstructions in Oregon's Rogue River basin; and the Nelson Dam on the Naches River in Yakima, Washington. 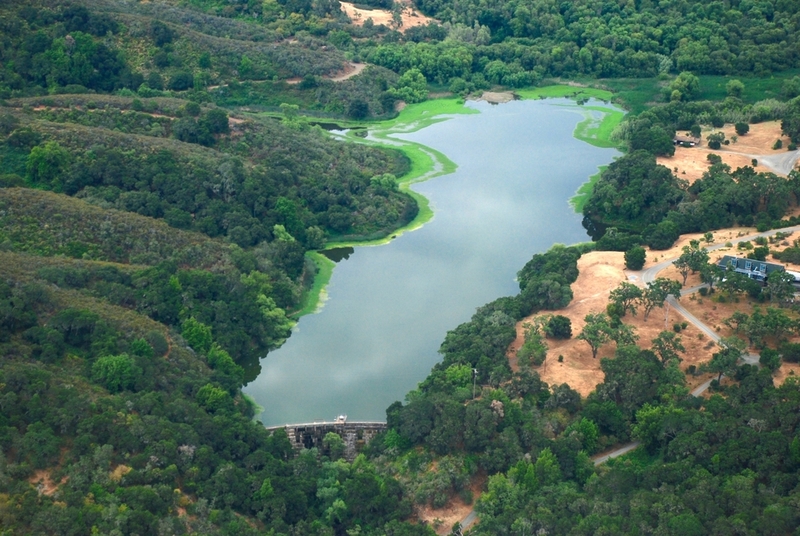 Not on the current list is the dam on Corte Madera Creek that created Searsville Lake, a private lake owned by Stanford University in the Jasper Ridge Biological Preserve. Opponents of that dam say its removal would improve the health of the San Francisquito Creek watershed, including restoring a route for steelhead trout to swim upstream and spawn. Among those opponents is Matt Stoecker, director of Beyond Searsville Dam, who called the Open Rivers Fund progressive and collaborative "where the dam owner supports transitioning away from an obsolete dam and towards less harmful options. ... When Stanford is ready to move forward with Searsville Dam removal, multiple funds and grant programs like this are poised to support them." In a 2015 report, Stanford said that while it valued keeping the 65-foot-tall, 275-foot-wide dam up for flood control, it would consider steps to allow passage of fish. As a kid, Matt Stoecker loved to explore and fish in the clear-flowing creek running through his hometown of Portola Valley, California. One day, he hiked far downstream and saw the waters wend into a stagnant, brown reservoir formed by the Searsville Dam. Walking around to face the massive structure, Stoecker watched a huge silver fish—“the size of my arm”—break the surface of the pool in front the dam. The steelhead leapt five feet in the air, smashed its head against the concrete wall, and fell back into the water. Stoecker, an ecologist and 2015 National Geographic Adventurer of the Year, now fights to tear down Searsville Dam and other “deadbeat dams” across the western U.S. The movement was illustrated by the award-winning 2014 documentary DamNation, which he produced with Felt Soul Media's Ben Knight and Travis Rummel and Patagonia. Stoecker has shepherded recent negotiations and agreements to remove several dams over the next few years, including Lagunita Dam, also owned by Stanford University, and Matilija Dam in Ventura County, California. Scientific evidence shows that ecosystems can rebound once dams are removed, as seen recently in the recovery of Washington State’s Elwha River after the Glines Canyon Dam was removed in August 2014, the largest dam removal project in U.S. history. The free-swimming fish bring nutrients from the ocean to the inland watershed and spur the resurgence of rivers, wetlands, and forests where there were artificial lakes. “Steelhead swam through the giant hole blasted in the base of Condit Damon the White Salmon River before the bulk of the dam was even removed,” Stoecker says. “With each new dam that is taken down, it become increasingly clear that he benefits from dam removal are instantaneous, far reaching, and lasting.” And he argues that doing nothing is not an option. In a disappointing decision, Stanford announced that it has preliminarily chosen to cut a hole at the bottom of Searsville dam as its preferred option for allowing steelhead to travel past the dam, but it will study the option further before making a final decision. The dam has blocked threatened steelhead trout from reaching miles of good habitat and has dried up the creek since about 1892. Now the reservoir is over 90 percent filled in with sediment and is no longer needed to supply water to the golf course and landscaping. We appreciate that Stanford has chosen to abandon Searsville as the water source for its golf course and landscaping, but we believe cutting a hole in the dam is inferior to full dam removal with respect to achieving Stanford’s stated goals. American Rivers, Beyond Searsville Dam, California Trout, and dozens of other conservation groups and businesses have repeatedly called for dam removal. Studies conducted by Stanford over the past two years demonstrate that the dam can be safely removed and improve flood safety for downstream communities. American Rivers named San Francisquito Creek one of America’s Most Endangered Rivers of 2014 because of Searsville Dam, and citizens have sent more than 25,000 letters to the university calling for dam removal. Last month the California Water Resources Control Board, from whom Stanford must get a permit for any Searsville project, reiterated their support for dam removal and raised concerns about other options, including cutting a hole in the dam. The Town of Portola Valley, just upstream of the dam, requested that Stanford restore “unimpeded” wildlife migration and watershed heath; outcomes that can only be accomplished with dam removal. The process is by no means over. A new study sums up what scientists now know about the environmental effects of removing dams from rivers. It concludes that rivers and fish respond quickly after a dam is removed, and the results are mostly positive. “Heraclitus has said you can’t step in the same river twice,”said study co-author Gordon Grant. “Well, you don’t get exactly the same river back after you take a dam off it that you had before, but you can come pretty close. In some cases, it can even be difficult to identify in just a few years where the dam was.” Rivers often disperse the extra sediment from behind a dam within weeks or months of dam removal, the study finds. Migratory fish move swiftly to recolonize newly accessible habitat – at times swimming past the former dam site within a matter of days. The research, published Thursday in the journal Science, compiles the findings of more than a hundred studies on individual dam removals. The Searsville Dam is causing big trouble on the peninsula. The 122-year-old, 65-foot-tall dam is closed to the public, hidden away on 1,200 acres owned by Stanford University. Dare to be 100: DamNation; What Would John Gardner Say? Last night I had the opportunity to check out the important new documentary film DamNation, that has already won honors at first-rank film festivals nationwide. It is a precise retelling of the history of American dam building which reached a fever pitch in the early 1920s. Thousands were built all over America. It seems that no river or creek was exempt. The thirst for power jaded any consideration of unintentional consequences into the future which number many, but the worst offense to me is the desecration of some of our most precious ecosystems, particularly for the fish whose existence in a healthy stream and river bed is essential. This grim development of thousands of dams, most of which originally were well intended, but are now mostly derelict remnants, has resulted in the havoc that has cost the lives of billions of fish who were thirsty for living space. This issue was important but remote to me until last night, when my neighborhood gathered to view the release of this wonderful film. Right there, hidden but central to our neighborhood is the Searsville Dam, built in 1892, simply to abet the water supply of San Francisco, 30 miles to the north. Not surprisingly, such intention was never fulfilled. It was subsequently acquired by Stanford. 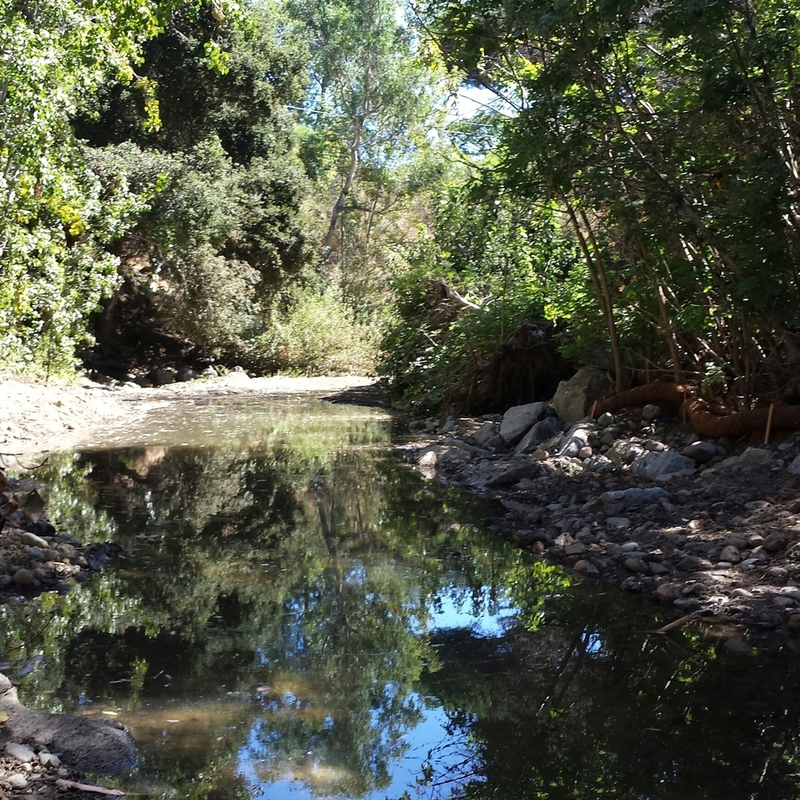 This dam which sits astride the San Francisquito Creek has languished into disrepair. Its only present usage is to supply water for the Stanford University golf course. Meanwhile untold millions of migratory salmon are obstructed from their original habitat. Their existence is held hostage to the caprice of Stanford. Stanford University is my home church and to millions of alumni, faculty, and other neighbors and friends. All of us are immensely proud of its grandeur. One of its most esteemed members was John Gardner, who is still listed in its pantheon. John delivered the commencement address at the 100th graduation. Stanford accorded him their highest distinction that of the Uncommon Man. John served in Lyndon Johnson's cabinet as Secretary of HEW 1963-1969, and among other things brought in Medicare. I often reflect what would John have to say about X,Y or Z. What would John Gardner say about Stanford's dereliction in preserving this decrepit relic so that it can water its golf course? I am certain that John, like thousands of others, would cringe in embarrassment. Stanford, please deserve your exalted reputation in society, and tear down the dam. Stanford University is finding itself at the center of an unlikely environmental battle. It centers on an aging dam and the barrier it creates for native fish. A decision on whether to tear it down is expected later this year. Lush trees grow along the banks of San Francisquito Creek Palo Alto, but there is no water this time of year. That's because a dam, owned by nearby Stanford University, keeps it from flowing. The final chunks of concrete are expected to fall this September in the nation’s largest dam-removal project, but nature is already reclaiming the Elwha River on Washington’s Olympic Peninsula. So much sediment, once trapped in reservoirs behind two hydroelectric dams, has flowed downstream that it has dramatically reshaped the river’s mouth, replenished eroding beaches and created new habitat for marine creatures not observed there in years. Corte Madera Creek, below the Searsville Dam, on Feb. 28 shows a bed of angular rocks that environmentalists say are not suitable for steelhead trout. Flowing over 250 miles from the high desert of southern Oregon through the Cascades Mountains before emptying out into the Pacific Ocean in northern California, the Klamath River and its Coho and Chinook salmon and steelhead runs were vital to Native American tribes for thousands of years before settlers arrived. But within decades of their arrival there would be half a dozen dams constructed on the river, effectively blocking salmon and steelhead migrations on what was once the third-highest salmon producing river on the West Coast. The river that was fabled for its millions of salmon each season saw significant decreases following dam construction. But now after nearly a century, an agreement has finally been reached to remove four dams on the Klamath River by 2020 as the first step towards restoring the salmon and steelhead migrations in the Klamath basin. The requested measures include allowing bypass flows to support water levels downstream, as required by State and Federal law, which has never been implemented by Stanford. In past years, Stanford University has degraded fish habitat in San Francisquito Creek and its watershed by diverting significant volumes of water to irrigate its golf course and other campus landscaping. The 125-year old Searsville Dam blocks native salmonids from accessing high-quality habitat upstream in the Portola Valley area, and continues to degrade fish habitat downstream of the dam. [...] Even under our assumptions, which would tend to minimize evidence of an incipient mass extinction, the average rate of vertebrate species loss over the last century is up to 114 times higher than the background rate. Under the 2 E/MSY background rate, the number of species that have gone extinct in the last century would have taken, depending on the vertebrate taxon, between 800 and 10,000 years to disappear. These estimates reveal an exceptionally rapid loss of biodiversity over the last few centuries, indicating that a sixth mass extinction is already under way. Averting a dramatic decay of biodiversity and the subsequent loss of ecosystem services is still possible through intensified conservation efforts, but that window of opportunity is rapidly closing. The alternatives would also allow the university to continue to use water from the creeks. [...] "This recommendation creates a new point of diversion downstream and shifts water storage from Searsville to Felt Reservoir. [...] "The recommendation regarding water diversion and storage is intended to preserve Stanford's rights to creek water diversion and storage considering the effects of climate change, population growth, and drought on the region's water sources," the committee wrote. But not everyone agrees with the steering committee's choices. Two key organizations still say removing the dam is the only acceptable action. "Poking a hole in an unneeded dam or letting it fill in with sediment are not viable solutions. These are ineffective Band-Aids that are unlikely to secure permits or attract funding support," said Matt Stoecker, a biologist for Beyond Searsville Dam and a member of the advisory committee. The Portola Valley Town Council has put itself on record supporting steps that would create an unimpeded migratory path for ocean-going fish, such as steelhead trout heading home to the San Francisquito Creek watershed in the Santa Cruz Mountains. Federally threatened steelhead trout could return to the creeks upstream of Stanford University's Searsville Dam within weeks if the structure is taken down, according to a new report from a biologist and proponent of the dam's removal. Matt Stoecker based his assessment primarily on the widespread presence of rainbow trout, a close cousin of the oceangoing steelhead, in Corte Madera Creek and its tributaries. The fish rely on the same kind of freshwater habitat early in their life cycle, he said. "The big takeaway is that the federally threatened San Francisquito Creek steelhead are ready to return to high quality, historically accessible habitat upstream of the impassable Searsville Dam if and when Stanford will let them," Stoecker wrote in an email to The Daily News. "The high quality spawning and rearing habitat is still there, the native rainbow trout are still there, and adult steelhead are still trying to get back upstream, but Stanford's unnecessary dam won't let them." My boys and I have hiked up and down San Francisquito Creek hundreds of times. Though we’ve caught crawdads and skipped rocks, we also found dead steelhead trout stranded near a stagnant pool that was left behind as the creek ceased to flow during the late spring of 2013. Other steelhead have encountered the same fate in recent years. California’s wild steelhead are a highly resilient species, but they are struggling to survive in Bay Area streams and elsewhere due to widespread loss of adequate habitat and diversion of critical flows. Stanford University’s 125-year old Searsville Dam and other water diversions have kept the San Francisquito Creek much drier than it was for years before Searsville was built. When water was more plentiful on this and other creeks, thousands of steelhead and salmon would swim many miles upstream from the San Francisco Bay to spawn eggs in the headwater streams of the San Francisquito watershed. Today, the creek’s native steelhead population is listed as threatened, while the University continues to block their upstream migration by holding back water from local streams in order to irrigate its water-intensive golf course. The Elwha River, which courses through northwest Washington state’s Olympic Peninsula, once hosted enormous runs of chinook and red salmon. But that came to an end in 1913 with the building of the Elwha River dam. “There's nothing more painful than to see red salmon banging up against the dam, which is what you saw when you went there,” said Interior Secretary Sally Jewell, at the annual meeting of the Society of Environmental Journalists in New Orleans on September 5, 2014. Built in 1892 and choked nearly to the brim with sediment, the [Searsville Dam] blocks the migration of one of the bay's last remaining populations of native steelhead trout, the group American Rivers said in a report being released Wednesday. The reservoir irrigates campus lawns and the university golf course. It’s a pretty sorry sight to see a threatened steelhead trout flopping around without enough water. But that’s what’s happening in San Francisquito Creek in Palo Alto, where the creek is drying out well before it should this year and jeopardizing the the most viable remaining native steelhead trout population in the Bay Area. The National Marine Fisheries Service is investigating whether Stanford University's operation of Searsville Dam in San Mateo County is violating the Endangered Species Act. The Searsville investigation was closed due to lack of resources; NMFS' Lead Investigator noted that the case merits the agency's attention and requires further investigation.